The AXP209 is the PMU (Power Management Unit) used by A10, A13 and A20 SoCs and developed by X-Powers, a sister company of Allwinner. The AXP209 has 4 GPIOs which can be addressed from fex files as port:powerN (N in [0..3]). AXP209 is designed to be a highly-integrated power system management IC that is optimized for applications requiring single-cell Li-battery (Li-Ion/Polymer) and multiple output DC-DC converters. AXP209 integrated over / under voltage (OVP / UVP), over temperature (OTP), overcurrent protection (OCP) circuit. AXP209 6mm x 6mm 48-pin QFN package. 27 LDO1SET I It set the LDO1 default voltage. Battery activation mode may indicate that the battery is faulty. This mode is entered either from pre-charge mode or constant current mode under certain conditions. In battery activate mode, the charger always inputs relatively low current to batteries. AXP209 will exit activate mode and release IRQ11 only if the battery voltage has reached V RCH. AXP209 will indicate whether the charger is in battery activate mode or not in register REG01H. Note: As long as the external power supply, battery or battery backup certain power exists, this data will be kept, not affected by the switch machine. Note, the 'instant' rate is approx. 0.0167 V/uS. The datasheet is incorrect here. 00: 128mS; 01: 3S; 10: 1S; 11: 2S. 00: 1S; 01: 1.5S; 10: 2S; 11: 2.5S. 00: 4S; 01: 6S; 10: 8S; 11: 10S. The AXP interrupt system has 2 bits for every interrupt, offset by 8 bytes. The first bit is to enable or disable (mask) an interrupt, the second bit, 8 bytes later, is to indicate the interrupt state, e.g. has the interrupt fired. Additionally, the interrupt status bit is also used to clear the interrupt, so that it can fire again. 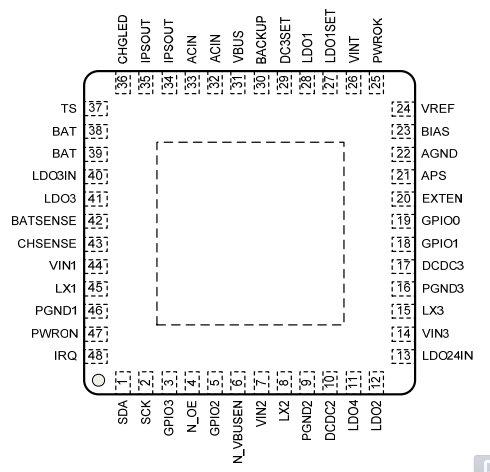 For example, register 0x40 bit 7, ACIN Over-voltage, can be enabled or disabled by writing a 1 into bit 7 of reg 0x40. When an interrupt is fired and the interrupt line is pulled low, bit 7 of 0x48 will be set to 1. To clear this interrupt, write a 1 into bit 7 of 0x48. First register is high 8 bits, second is lower 4 (lower 5 for battery discharge current). This page was last modified on 2 March 2017, at 10:36.